Most people seeking to gamble outside their state use proxy servers to disguise their location. Enter GeoComply, often called the gold standard for geolocation services. Backing up about 100 feet from the California border near the Fashion Outlet in Primm, Nevada, a reporter is finally able to log into the World Series of Poker application on an iPhone. 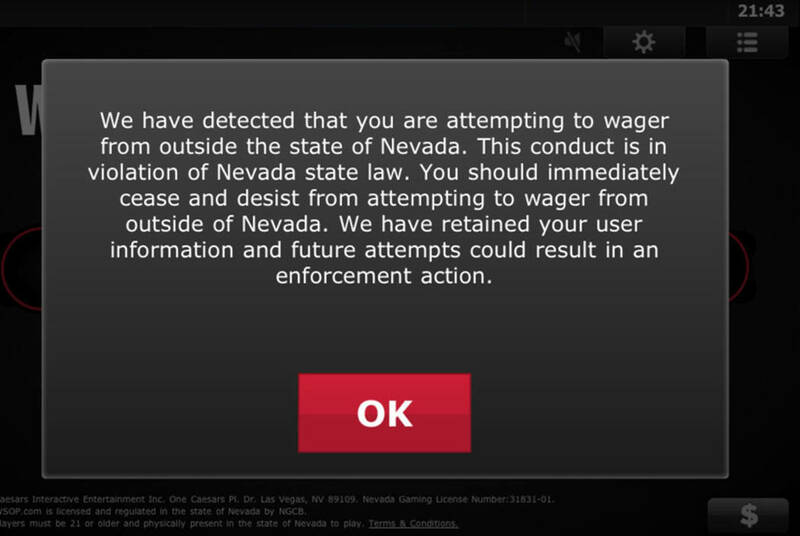 The reporter is here to test the accuracy of the geolocation service used by the poker application to ensure people physically outside Nevada cannot access the game. WSOP uses the geolocation technology of Vancouver-based GeoComply, a 5-year-old company that also serves daily fantasy sports company Draft Kings and MGM Resorts. Geolocation and age identification services have been at the heart of the debate over legalizing online gaming. Opponents have sought to ban online gaming in part on the basis that neither technology is fool-proof. The reporter’s first attempt to log into WSOP just 10 feet from the California border didn’t work. The reporter’s exact location could not be determined, a message on WSOP said. Once the reporter is logged into WSOP, a driver slowly takes him over to the border to the Primm Lottery in California as he plays WSOP. The reporter is able to fold a hand as they reach the store in California. As he tries to place a bet on the next hand while circling the store, a black box pops up onto his screen, halting play. While the reporter’s attempt to play outside Nevada was caught quickly by GeoComply, it was rather an unsophisticated test trial. Most people seeking to gamble outside their state use proxy servers to disguise their location. Such proxy servers tripped up Draft Kings in 2015, leading to criticism it wasn’t doing enough to prevent illegal betting. The company then hired GeoComply, which it called “the gold standard” for geolocation services. GeoComply holds licenses to operate in New Jersey, Nevada and Delaware, the three states that permit online gaming. The company is also authorized to service the Georgia Lottery. GeoComply uses what is called a “multi-tier system of checks” to determine someone’s location, such as IP address, GSM, GPS and Wi-Fi positioning. David Salas, deputy chief of the enforcement division at the Nevada Gaming Control Board, said the state’s geolocation providers had their systems “vetted” for accuracy. There have been no reported cases of people logging in from outside Nevada, Salas said. The National Association of Convenience Stores, a past critic of online gaming and geolocation services, did not respond to requests for comment. Chief Executive Officer Anna Sainsbury founded GeoComply in 2011 after consulting Washington, D.C., officials about online lottery regulation. “After the D.C. project ended, I couldn’t shake the notion that somebody really should create a technology capable of enabling highly regulated, jurisdictional industries to operate over the internet,’’ Sainsbury said. She pitched her concept to gaming companies exhibiting at G2E in Las Vegas in 2011. GeoComply’s first order rolled in from Bally Technologies, which had a customer seeking to go live with online poker in Nevada. The company got its breakthrough when it received approval by New Jersey to service six online gaming operators. It will soon launch a project with MGM Resorts to permit patrons to wager on their phones when on-property. Sainsbury has diversified from providing geolocation services to U.S. online gaming jurisdictions to other countries and industries. It now blocks about 100,000 illegal attempted transactions a month worldwide. From a handful of workers in 2010, the company has grown to close to 60 people with at least 50 in technical roles. GeoComply has just a few employees in Las Vegas but might expand when more states go online and as the MGM project launches. The company’s online gaming revenue is primarily driven by the volume of transactions. Games such as poker are more lucrative than casino games. Daily Fantasy Sports operators such as Draft Kings generate “huge volume,” Sainsbury said, with peak transactions per second reaching as high as 1,000 in the early stages of the NFL season. With online gaming’s future in the hands of legislatures around the United States, GeoComply is focusing on other industries for growth. Revenue from U.S. online gaming now pales in comparison to the film, TV and sports world. While the armed forces would seem to be a potentially big market for location services, Sainsbury sees opportunity in a different sphere.